Coding skills play a foundational role in understanding how to communicate with technologies that allow students to access opportunities in the computer science field. Fisler’s focus is not just with learning coding skills, but understanding a greater purpose in utilizing tools and skills to discover pathways towards a passion, accelerated academics, and/or future career. Technology becomes a critical and integrated part of learning and is used to solve problems, especially problems that are undefined. State of the art equipment, such as laptops, iPads, Lego Mindstorm EV3s, Hummingbird Robots, Raspberry Pis and Vex Robots, is essential in defining 21st century learning. With cutting edge resources, students embrace the Design Thinking Model by using their one of a kind ideas to produce novel creations that have potential to change the world. Students become makers, not mere consumers. 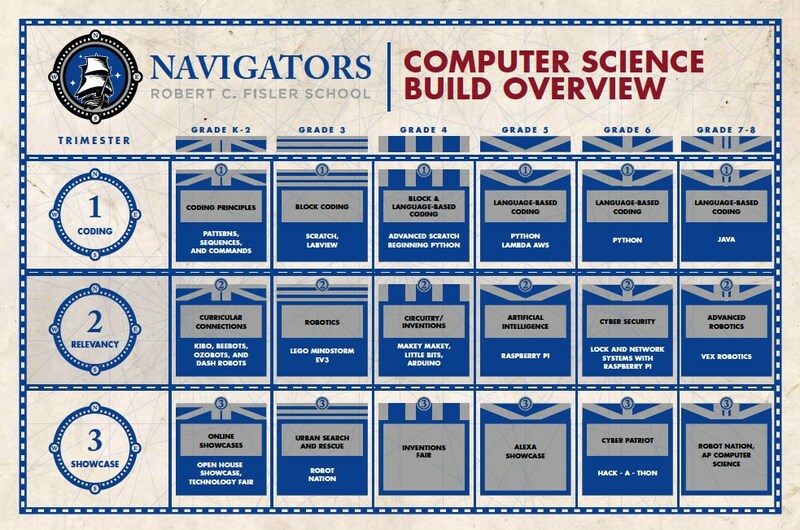 Students become programmers, engineers, inventors, and designers: specialist and leaders in their field. Real World Connections to community and global needs based on Sustainability Goals and incorporate a mentorship model that allows experts to guide students. Fisler Foundation for the Advancement of Science and Technology (F2AST) supports and cultivates cutting-edge teaching and learning in science and technology for all grades. Members include Fisler parents, staff, administration, and community members. Fisler’s Foundation supports the 1:1 laptop program in grades 3-8, 1:1 iPad program in 1st and 2nd grade, MobyMax K-8 Common Core Standards Software, 6th grade Science Camp, 8th grade science awards and scholarships, 8th grade math awards and scholarships, Science Olympiad, Lego One Competitive Robotics League, 3rd grade Terrapin Probots, MinecraftEdu, as well as many other resources. For the last two years, F2AST has been awarded with the Southern California Edison grant to support computer science in middle school. After school programs, sponsored by FFAST, are offered to students to further deepen their experience and hone their specialized skill with technology such as in web development, stop motion animation, filmmaking, Python coding, Minecraftedu, and 3D game design. FFAST will continue to seek grants and plan fundraisers to support Fisler’s vision. 1st and 2nd Grades have 1:1 iPads and 3-8th Grades have 1:1 Laptops through a BYOD (Bring your Own Device) Program. ﻿Fisler School partners with Cod.Ed to provide coding instruction in grades 3-8. Students learn coding concepts, block coding, and language based coding, progressively through the grade levels.